The article is devoted to the modern methods of constructing original astrophysics problems which needs the application of classic mathematical theories. Research focus: perform a theoretical analysis of pedagogical use the activity approach to teaching fundamental disciplines subjects by didactic principles of interaction between the learning and training practice, and the expansion of scientific outlook of students. Problem research: 1) analyze the current approaches to modern methods of solving astrophysical problems; 2) view an examples of problems as a means of deepening, broadening and stronger theoretical material in physics and astronomy. Object of research: the process of learning of students using activity approach. 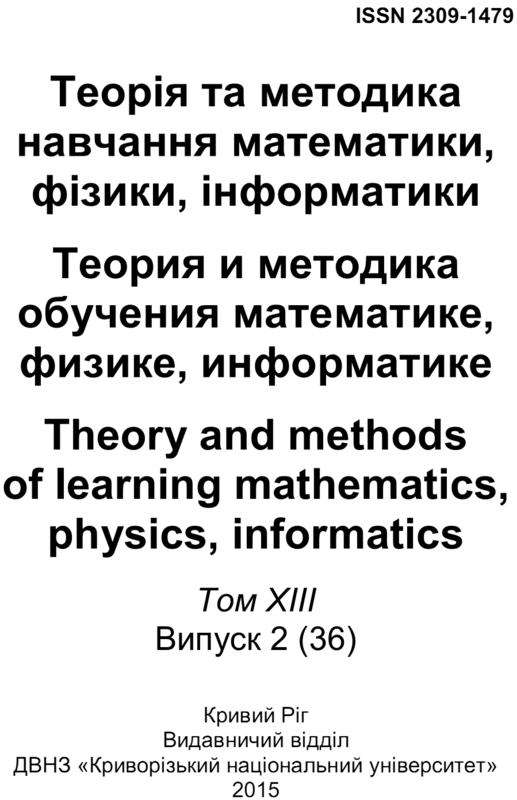 Subject of research: features of the methodic using astrophysical problems in teaching fundamental disciplines. The research methods: the study of experiences and works of Ukrainian authors on the problems of implementation and use of modern methods of solving problems. The results: advantages and lacks of author methodic solving astrophysical problems are detected. The main conclusions: inclusion astronomical material in the learning physics content, on the one hand, and strengthening the evidence of real astrophysical research results, on the other hand, promotes the formation of modern scientific thinking style of learners, because it allows a wider, fuller and more systematic nature-accordance principle implement. 1. Краснобокий Ю. М. Збірник задач з астрофізичним змістом / Ю. М. Краснобокий, І. А. Ткаченко, В. І. Хитрук. – Умань : ПП Жовтий О. О., 2013. – 168 с. 2. Краснобокий Ю. М. Розв’язування задач з фізики (Квантова фізика. Фізика атома та атомного ядра.) / Ю. М. Краснобокий, П. П. Товбушенко, М. М. Яровий. – Умань : СПД Жовтий, 2008. – 132 с. 3. Ткаченко І. А. Підготовка вчителя астрономії до розв’язування задач з астрофізичним змістом / І. А. Ткаченко, Ю. М. Краснобокий // Теорія та методика навчання математики, фізики, інформатики. – 2012. – Том Х. – № 2 : Теорія та методика навчання фізики. – С. 272-278.